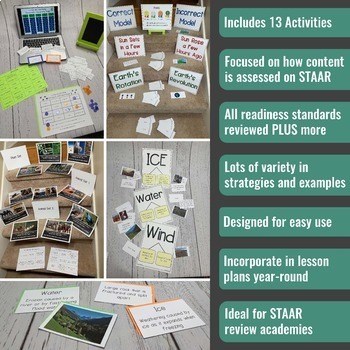 Looking for fun, engaging activities to review your students for STAAR? 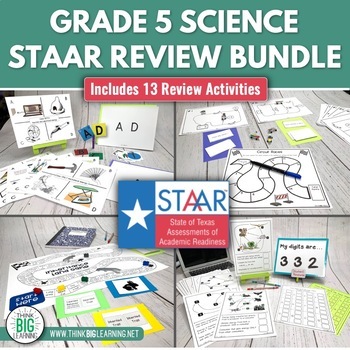 This 5th grade science review bundle has everything you need for your STAAR academies! Included are activities for all 11 readiness standards that make up 65% of the STAAR test; we also have activities that address 3 supporting standards. Each activity can be used for formative assessment just before STAAR or throughout the school year to check for understanding on each topic. Activities are designed to be used interactively with student groups, but all could also be modified to use in small groups or one-on-one tutoring sessions. 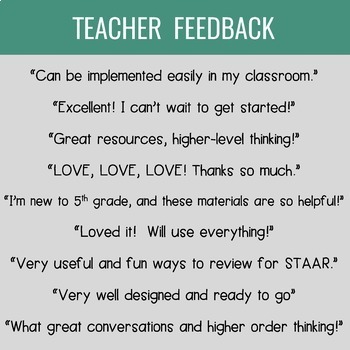 All content is designed to prepare students for the types of thinking they'll need to be successful on STAAR. Activities were created using the streamlined TEKS. Click the “Follow Me” button next to our store logo/name to receive notification of new products we post as well as sales. Copyright © 2019 Think Big Learning. By purchasing this file, you agree to the following terms. All rights reserved by author. This product is to be used by the original downloader only for personal or classroom use only. Copying for more than one teacher, classroom, department, school, or school system is prohibited. This product may not be distributed or displayed digitally for public view. All graphics and fonts are also protected by copyright from their original author/artist.